Dengue (pronounced den' gee) is a disease caused by any one of four closely related dengue viruses (DENV 1, DENV 2, DENV 3, or DENV 4). 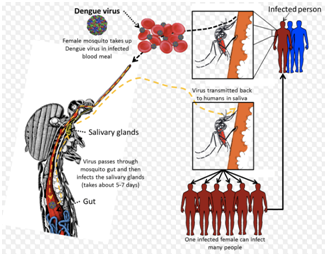 The viruses are transmitted to humans by the bite of an infected mosquito. Dengue is transmitted to people by the bite of an Aedes mosquito that is infected with a dengue virus. The mosquito becomes infected with dengue virus when it bites a person who has dengue virus in their blood. The person can either have symptoms of dengue fever, or they may have no symptoms. After about one week, the mosquito can then transmit the virus while biting a healthy person. Dengue cannot be spread directly from person to person. There is no vaccine for preventing dengue. The best preventive measure for residents living in areas infested with Ae. aegypti is to eliminate the places where the mosquito lays her eggs, primarily artificial containers that hold water. Patients who are already infected with the dengue virus can transmit the infection to other people via Aedes mosquitoes after the first symptoms appear (during 4-5 days; maximum 12). Watch for warning signs as temperature declines 3 to 7 days after symptoms began. 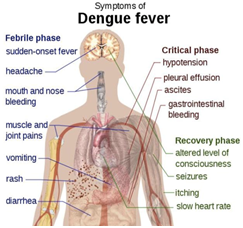 In addition, the patient with Dengue has a low platelet count and hemorrhagic manifestations, tendency to bruise easily or other types of skin hemorrhages, bleeding nose or gums, and possibly internal bleeding and are hence suffering from Dengue haemorrhagic fever. If you or any family member is suffering from suspected dengue fever, it is important to carefully watch yourself or relative for the next few days, since this disease can rapidly become very serious and lead to a medical emergency. The complications associated with Dengue Fever/Dengue Haemorrhagic Fever usually appear between the third and fifth day of illness. You should therefore watch the patient for two days even after fever disappears. There is no specific medication for treatment of a dengue infection. Persons who have dengue are prescribed analgesics (pain relievers) with acetaminophen and avoid those containing aspirin. Consult a doctor before taking any medication. They should also rest, drink plenty of fluids, and consult a physician. If they feel worse (e.g., develop vomiting and severe abdominal pain) in the first 24 hours after the fever declines, they should go immediately to the hospital for evaluation. 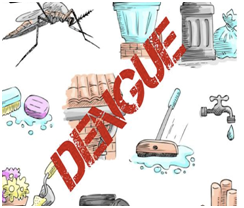 In a small number of cases a person with dengue goes on to develop a more serious and potentially life-threatening form of the condition known as severe dengue. Exactly why this is the case is unclear, but the main risk factor is having had a history of previous dengue infection. Another related complication is that people with severe dengue can experience a sudden and severe drop in blood pressure. This is known as dengue shock syndrome. If you have any of the symptoms of severe dengue, you should seek immediate medical help to prevent the disease from progressing. Cases of Dengue fever/Dengue Haemorrhagic Fever (DF/DHF) should be observed every hour. Serial platelet and haematocrit determinations, drop in platelets and rise in haematocrits are essential for early diagnosis of DHF. Timely intravenous therapy -> isotonic crystalloid solution can prevent shock and/or lessen its severity. Keep body temperature below 39oC. Give the patient paracetamol as per doctor's advice. Give large amounts of fluids (water, soup, milk, juice) along with the patient's normal diet. The patient should take complete rest. Do not wait in case the above symptoms appear. Immediately consult a doctor. It is crucial to quickly get treatment in case of these complications. Do not take Aspirin or Brufen or Ibubrufen. A dengue fever vaccine is in development, but isn't generally available. If you're living or traveling in an area where dengue fever is known to be, the best way to avoid dengue fever is to avoid being bitten by mosquitoes that carry the disease. Stay in air-conditioned or well-screened housing. It's particularly important to keep mosquitoes out at night. Reschedule outdoor activities. Avoid being outdoors at dawn, dusk and early evening, when more mosquitoes are out. Wear protective clothing. When you go into mosquito-infested areas, wear a long-sleeved shirt, long pants, socks and shoes. Use mosquito repellent. Permethrin can be applied to your clothing, shoes, camping gear and bed netting. You can also buy clothing made with permethrin already in it. For your skin, use a repellent containing at least a 10 percent concentration of DEET. Reduce mosquito habitat. The mosquitoes that carry the dengue virus typically live in and around houses, breeding in standing water that can collect in such things as used automobile tires. Reduce the breeding habitat to lower mosquito populations. The most effective and important tip to avoid dengue is stay away from mosquitoes and from stale water. Apart from that once you are suffering from dengue your diet plays a very important role to bring you out from this viral fever. It is very necessary to supply your body with plenty of fluids throughout the day. Oral rehydration solution, fruit juices, coconut water, lime juice etc can be given which will help to remove the toxins from the body. Virus gets excreted via urine hence reducing its load in the body. During fever appetite of patients is really very low, so it becomes our responsibility to select food which patient likes and apart from that the food selected should be such which has high energy in small quantities. For e.g. instead of chapatti give sheera with good amount of ghee and sugar. 1 chapati to eat would be difficult if compared with sheera. Handful of nuts will also be a good option. In this condition fruit juice will be considered over whole fruits. Whole fruit fiber will give him satiety due to which eating quantity of food will be restricted. Do not over load patient with spices, salt, fried and oily food. Soups are good option. It will help to enhance his/her hunger and also improve his mouth taste. Your diet can include boiled vegetables, rice porridge, soup, toast, apples, bananas and tea. If patient is not comfortable with solid food patient can stick to liquids for 2-3 days after which solid intake should be gradually started. In dengue the liver of the patient is targeted. So there is impaired function of liver. So it becomes very important to supply body with easy to digest food. After patient's intake improves next focus after hydrating the patient is to start with a high protein diet. Protein rich foods have to be included in the diet like milk and its products, pulses, eggs, fish, Chicken etc. A high protein and calorie diet is recommended even after the fever is gone to restore all the resources of vitamins, minerals, proteins, fats in the body.